SAUDI Aramco says its oil refinery joint venture with France’s Total will double capital investment to 7.12 billion riyals ($1.90 billion) at Jubail, the largest industrial city in the region. Saudi Aramco Total Refinery and Petrochemicals Company (Satorp) will increase spend at the site from 3.56 billion riyals in the first-quarter of 2013, according to a statement on the Saudi bourse website. State-owned Aramco holds a 62.5 per cent stake in the project, with Total holding the remaining 37.5 per cent stake. The capital increase will be on a pro-rata basis, the statement says. In 2010, the joint-venture firm said it had raised $8.5 billion towards the $12.8 billion project and issued in 2011 3.75 billion riyals Islamic bonds to help pay for it. The refinery, whose construction is close to completion is part of Saudi Arabia’s drive to boost crude refining capacity and would process heavy crude from Aramco’s giant 900,000 barrels per day (bpd) Manifa oilfield. Aramco and Total have already started testing some units at the 400,000 bpd refinery, due to be fully operational in the third quarter of 2013. The refinery would produce around 190,000 bpd of diesel, around 90,000 bpd of gasoline and 50,000 bpd of kerosene as well as petrochemicals. Satorp is to begin marketing its first diesel from its $9.6 billion complex in the second quarter of 2013. The refinery is still under construction at Jubail in the Eastern Province but is expected to be on stream ahead of its planned completion date of 2013. 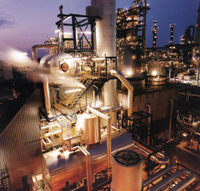 The petrochemical units will be completed in 2014. Saudi Aramco and France’s Total have started testing their new refinery at Jubail, three sources with knowledge of the project said, raising the prospect of full operation of the $14 billion facility ahead of a scheduled start-up in the third quarter of 2013. By last August, Satorp had fired up the boilers at the plant, designed to reduce Saudi reliance on imports and meet rapidly rising fuel demand. Aramco relies heavily on imported gasoline and gasoil and plans to boost domestic refining capacity from 2.26 million bpd to 3.5 million bpd by 2016. “Boilers have already started. The first 200,000 bpd CDU is going to start before the end of 2012, that is what the JV is targeting,” a second industry source says, adding that the second CDU was due to be brought online in the first quarter of 2013. Saudi Arabia’s domestic fuel consumption has been booming because of a growing population and economy. Heavy government subsidies that make retail fuel prices some of the lowest in the world have also helped stoke demand. “Aramco wants to become as self-sufficient as they can as quickly as possible,” the second industry source says. The state-run company is building two more refineries apart from Satorp; one near the Red Sea city of Yanbu with China’s Sinopec, and another at Jizan, near the border with Yemen. All will produce cleaner fuels and some petrochemicals. It has also started upgrading existing refineries with a $2 billion project at a joint venture with US-based ExxonMobil due to be in operation in 2013. Jubail will refine Saudi heavy crude into a range of fuels – from gasoline to petroleum coke – for domestic consumption and export. Around 54 per cent of the project’s output will be diesel and jet fuel, with an estimated quantity of 11.4 million tonnes per year. Annual gasoline and petcoke production is estimated to be around 2.8 million tonnes and 2.1 million tonnes respectively.